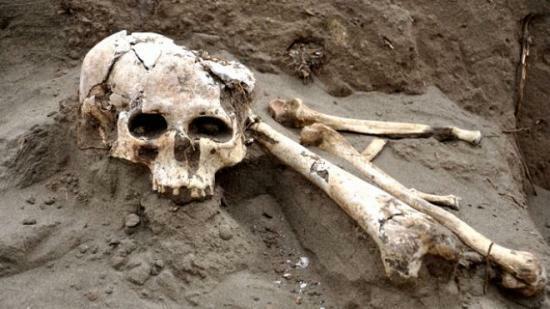 A skull and bones sit on a pre-hispanic tomb recently discovered in Lambayeque, northern Peru. According to Carlos Wester, chief of the team of archaeologists who discovered the tomb, it belongs to a top lord of the Lambayeque culture, believed to have been an executioner. Archaeologists in Peru have discovered the tomb of a lord of the Lambayeque culture, believed to have been an executioner due to the three ceremonial knives found buried with him. 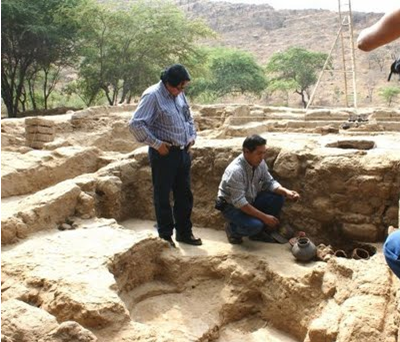 Near the pre-Hispanic tomb were human remains, as well as ceremonial knives, ceramic pots, a dress made from native cotton and a series of rolled copper discs, said Carlos Wester, director of the Bruning Museum in Lambayeque and one of the tomb's discoverers. Wester told AFP the person buried there was most likely in charge of human sacrifice. 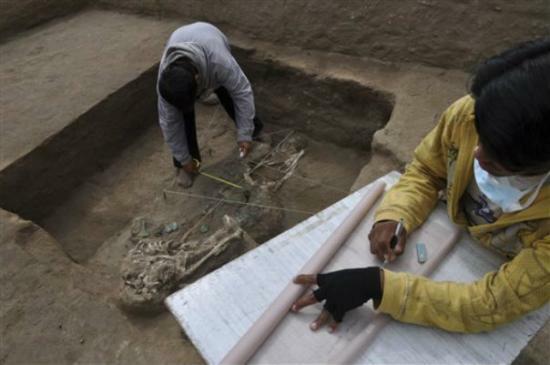 "We found the perfectly preserved tomb of a sacrificer of the Lambayeque culture, with copper machetes and human offerings laid around them," Wester told the news agency. The tomb was found in a place called "ceremonial fertility and water," two weeks ago in the archaeological complex Chotuna Chornancap, a thousand-year-old temple complex discovered in January 2010. The 20 to 30 year old resident of the tomb "played an important role in the ceremonies of human sacrifice" for the ancient culture, which flourished from 700 to 1375 AD. Sicán or Lambayeque culture emerged around the eighth century, lasted until 1375 and peaked between 900 and 1100. This civilization worshiped the "Lord of Sican"; during the heyday of the culture, there were seven to eight such figures representing the heavenly power on earth. They were described as wearing masks with winged eyes and pointed ears, the archaeologist said.